So the yearly cycle continues, with yet another iPod being updated this time round. Apple’s event at San Francisco saw the appearance of Steve Jobs to the masses, and it goes without saying the man had a hand in unveiling the latest iPod nano to the crowds, now in its fifth iteration. What makes the iPod nano so special this time round? Well, Apple has decided to throw in a video camera, a microphone and a speaker to what is already deemed as the most popular portable media player in the world, allowing music aficionados to shoot short video clips (limited by its memory, of course) regardless of where they are. These video clips can then be viewed over the computer after performing a quick and painless transfer, and further uploaded onto YouTube if you’re so inclined. According to Steve Jobs, Apple’s CEO, “iPod nano is the world’s most popular music player with over 100 million sold. And now we’ve added a video camera to its incredibly thin design, without any additional cost to the user.” New owners of the 5G iPod nano will be pleased to know that it comes with a larger 2.2″ display to make navigation easier on the eyes, while you get to enjoy more album art alongside the ability to shoot and view video clips in a jiffy. Apple has also included fun real-time effects in one’s video content including Thermal, Film Grain, Kaleido and X-Ray without the need to process it all over again using specialized software on a computer later on. Other features include an integrated FM radio with live pause and iTunes Tagging, where the former enables users to pause and resume playing their favorite FM radio shows – handy for various situations, while the latter lets you keep tabs on a song you like but can’t quite catch the title, letting you preview and purchase that tagged song on iTunes later on. 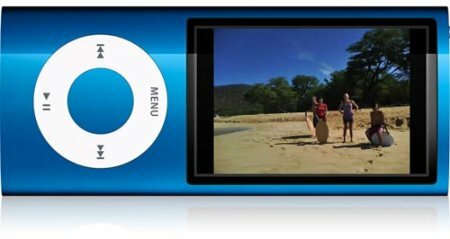 The fifth generation iPod nano will come in silver, black, purple, blue, green, orange and pink color choices, retailing for $149 for the 8GB model while the 16GB model is going for $179.